So, think about your own life. How much time do you spend sitting at work? Granted, some of you are grade school teachers, so you look longingly at your chairs, hoping for a calm moment that you can actually get off your feet. Some of you deliver mail or give shots to children and don’t have much of a need for an office chair, but many of you begin work every day by turning on your computer and sitting down in front of a screen. You are the people I am writing to right now. 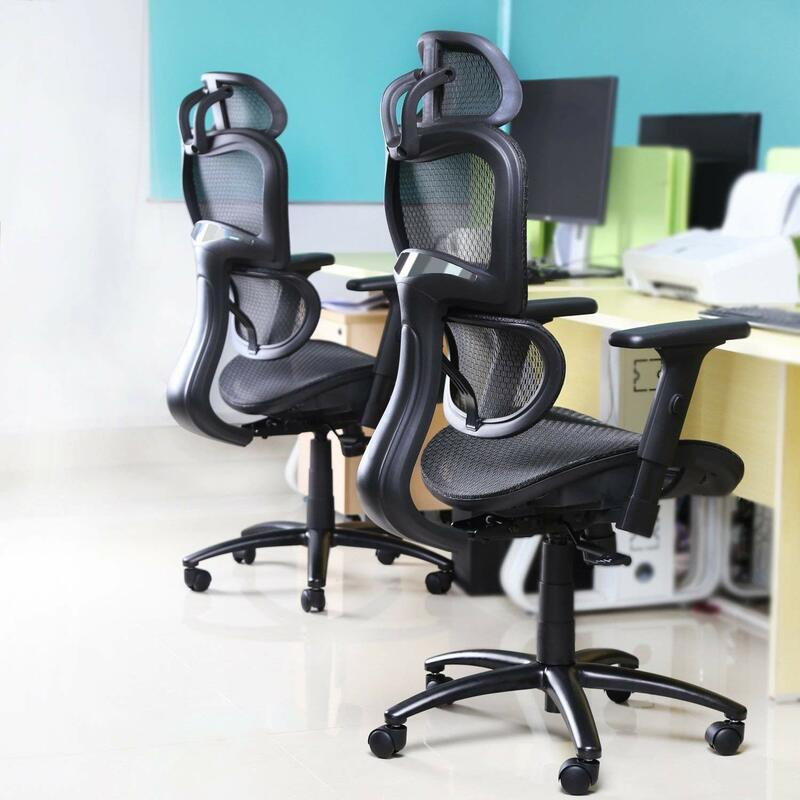 You are the people who need to know which is the best high back office chair. The workers who will either go home after a day of work ready to take on the evening’s activities or go home in pain because of spending eight hours in an uncomfortable chair. 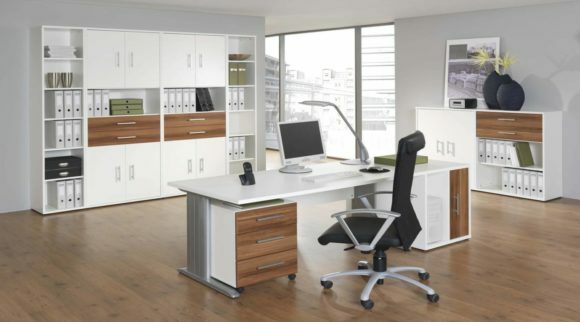 Read on to discover which piece of office furniture is best for you. 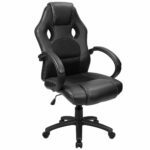 If you do a quick search on Amazon for office chairs, you will find some products that are less than $100 and others that are more than $800. Is it necessary to spend hundreds of dollars on a chair or does an inexpensive chair do the job just fine? What about those of you with health or mobility issues? What kind of chair is best for you? Is there a chair that’s best chair for gaming? What about the best chair for talking on the phone? What is the best chair to use while working at a keyboard? The best chair for napping? First, I will discuss nine different products currently sold on Amazon. I will inform you of the specs for each product. I will discuss the good and bad parts of the products’ designs. Then we will discuss how to pick a chair that is right for you. 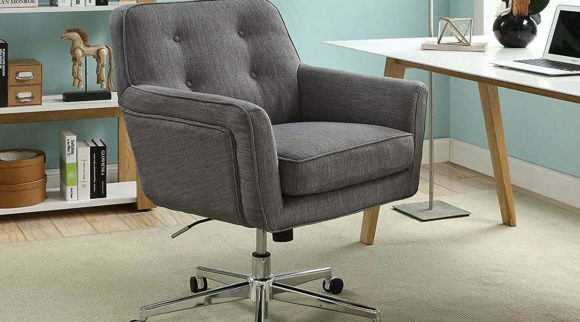 Here are our favorite picks for high back office chairs. The Flash Furniture model is one of three chairs on this list that has a separate headrest. Therefore, it is not one solid unit as the back of the chair. 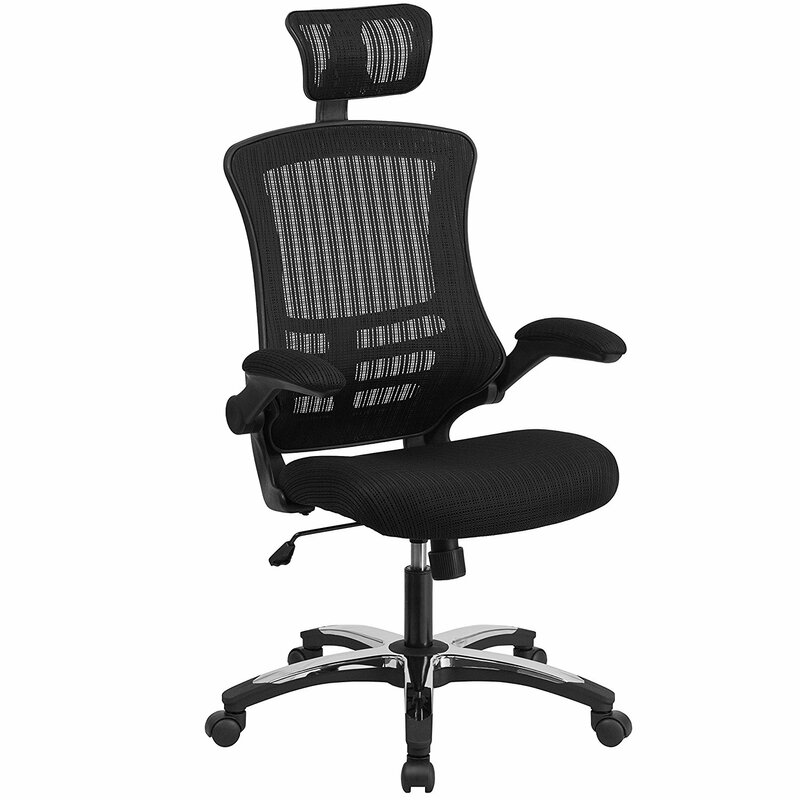 This chair is made of black mesh, which is a benefit if you are working in a warm environment. The seat is padded and still offers ventilation and measures 20 inches by 19 inches. The seat is described as a waterfall seat, which means the knees are lower than the hips. This helps relieve pressure on the lower back while sitting and keeps you comfortable for your entire workday. The chair is designed to provide support to your upper back. Supporting the upper back relieves tension in the lower back by preventing long-term strain. The chair weighs 33.7 pounds. It measures 24 x 25.5 x 52.5 inches. The weight limit of this chair is 250 pounds. The headrest can be adjusted up and down easily by pulling on the center knob. The Flash Furniture chair offers you free range of motion. Those sitting in the chair can rock and recline comfortably. This allows the user to move from his or her keyboard to a position natural to have a conversation with another person in the room. The chair also swivels 360 degrees. The height of the chair can be adjusted with a pneumatic lever, so those vertically challenged people can achieve a comfortable height from the floor. The Flash Furniture arms can be flipped up to get them out of the way without going through the hassle of detaching them. The arm height from the seat is 7.5 inches. The arm height is not adjustable. Being able to flip the arms back from the chair may be a great benefit for you. If you have a difficult time getting close to your work because of the arms on your chair, this will enable you to move closer without bending your body. Besides the high back version, we are discussing currently, the chair is also manufactured in a mid-back and mid back drafting chair versions. The high back version comes in black. Those ordering from Amazon can purchase this product assembled or unassembled. The assembly cost is almost the same cost as the chair itself. This most significant benefit of the Flash Furniture chair is that is that it is incredibly breathable. 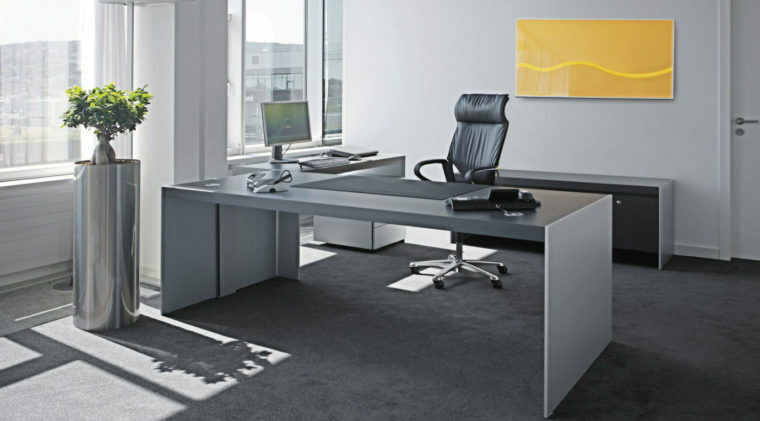 If your office is warm, the mesh material will allow air to flow easily throughout the seat. No more sweaty back! Another benefit for this model is the ease of removing the arms of the chair. The chair is also relatively inexpensive, especially if you assemble it yourself. The only major complaint about this product is that the arms are not adjustable in height. They also tend to be set at the height of most desks so if you are a tidy person, and you want your chair to slide under your desk each night, you will not be able to do this. The second piece of furniture we will be discussing is manufactured by Furmax. 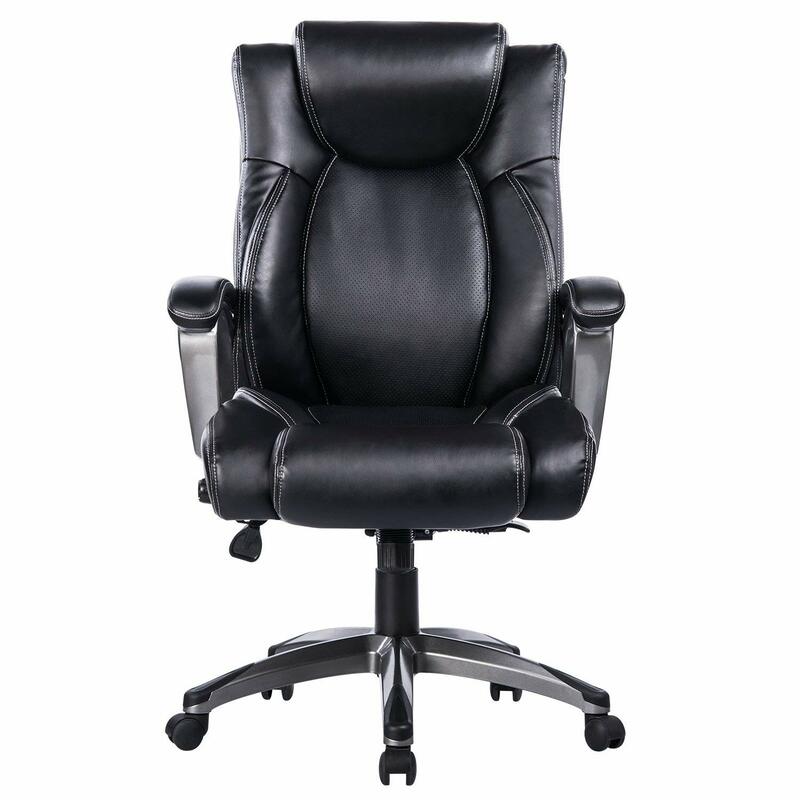 This chair is described as a high-back office and gaming chair. This chair does not have a separate headrest. Instead, it is a unit that is taller in the back, which enables the user to receive support on the back of the head while seated. This chair is made of PU leather and mesh. This means that it is made with a split leather backing covered with an embossed layer of polyurethane or vinyl. It has two cutouts on the back to provide ventilation. The cutouts on the seat make it look like a gaming chair. The bucket seat is padded. The seat measures 20.86 inches by 20.4 inches. The seat is ergonomically designed and relieves pressure on your lower back. The back of the chair measures 20.47 inches across and 28.34 inches tall (from the seat.) Some say this does not reach the back of the head, even for a person of average height. The chair weighs 35.1 pounds. It measures 24 x 25.5 x 52.5 inches. The weight limit of this chair is 280 pounds. The Furmax chair offers a free range of motion. Unlike the Flash Furniture model, you can also limit some of the range of motion. A lever keeps the chair from rocking or allows the chair this movement. It’s up to you! The chair also swivels 360 degrees and is on a five-star base with castor wheels. The height of the chair can be adjusted with a pneumatic lever. The lowest setting is 15.75 inches, and the highest is 19.69 inches. The arms on the Furmax chair can be adjusted up and down 4.7 inches. It doesn’t look as if the arms can be removed or rotated out of the way. It is unclear how the arm adjustment is made on the chair. The chair comes in many different colors including black, blue, gray, or red. Be careful when making your purchase. It looks as if some of the colors do not have the same features as the primary offering. This could be a problem with the Amazon listing. Do not assume if you pick a red chair that it will look exactly like the main product featured. The assembly of this chair requires two wrenches that are included in the box. It is not clear whether or not you can purchase this product already assembled. The product is easy to put together and can be assembled in approximately five steps. Like the Flash Furniture product, this Furmax chair is very economical. One benefit of this over the previous product is that the tilt feature can be locked into place and the arms can be raised and lowered. 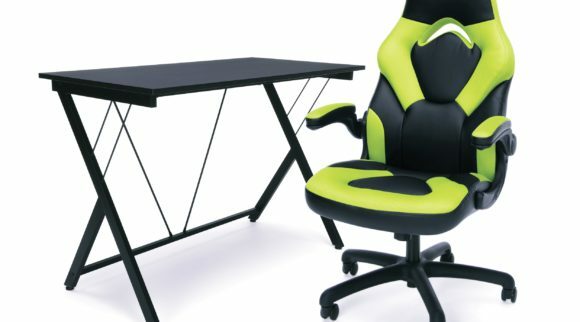 This piece of furniture is marketed as a gaming chair, and from the product literature, it looks as if it has been used in gaming competitions. Some say that this product seems to break faster than other products at the same price. This is unclear whether or not this is true. 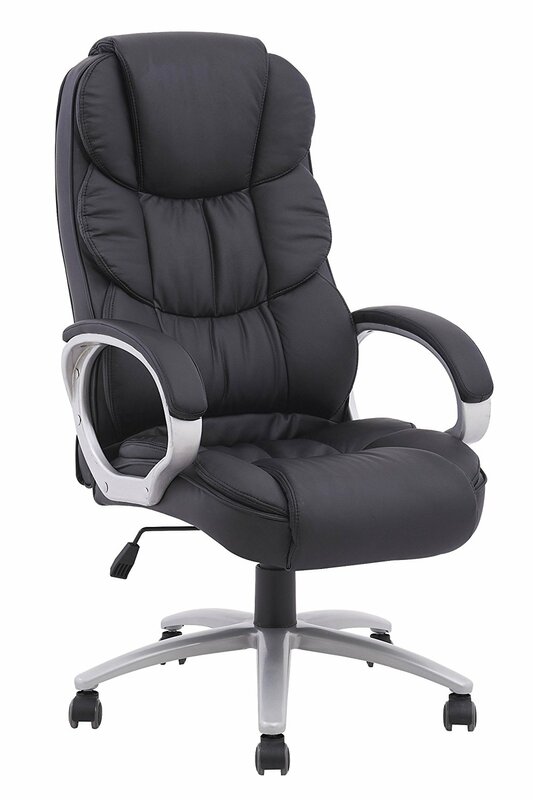 The Best Office Ergonomic Chair is described as an executive chair. It is made of PU leather, which again, is a bi-cast leather made with a split leather backing covered with a layer of a plastic-like material. The material is easy to clean. The backrest and seat on this high back office chair are padded and offer back and lumbar support. The seat measures 20 inches by 20 inches. It is designed to relieve back and leg pain and can help with your posture. The backrest of the chair measures 20 inches by 28 inches. The chair weighs 41.2 pounds. It measures 26 x 24 x 24 inches. The weight limit of this chair is 250 pounds. 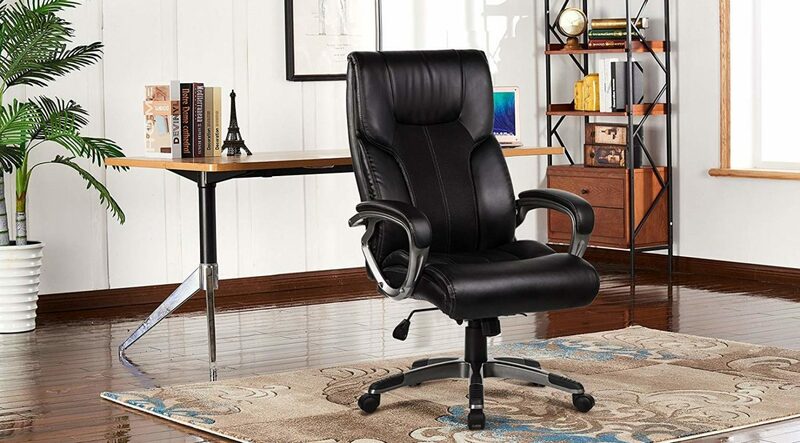 Like the others, the Best Office chair offers a free range of motion. Those sitting in the chair can rock and recline easily. This allows the user to move from an upright position to a laid-back position for phone calls or conversations with others in the office. The chair also swivels 360 degrees. Like the Furmax product, the Best Office Chair’s reclining feature can be locked into place. The user can also adjust the ease of rocking with a tension knob. Like the previous two best high back office chair options, the height of the seat can be adjusted with a pneumatic lever, so your comfort is not dependent upon your height. The chair can be adjusted between 19 to 23 inches from the floor. The Best Office product does not have adjustable arms. It also doesn’t seem as if the arms can be removed. The arms are padded. The Amazon listing may be in error. It looks as if the product comes in three different sizes. The sizes are listed as one, two, or five, and the price varies greatly depending on which you chose. It doesn’t look as if the product description varies depending on the size. Be aware of this snafu when you put your item in the shopping cart. The Best Office chair comes in black, white, and brown. It looks as if the black chair is the least expensive of the three choices. The chair itself sits on a five-star support system that has castor wheels. Like the first two products, this chair is also economical. It also comes in different colors, which was not an option for the first two products. It is easy to clean. The arms for this product are not adjustable or removable. If you desire adjustable arms, you will need to purchase a different product. The next best high back office chair is for two sizes of the same product. The chair, made by Kadirya, is extremely adjustable. The back of the Kadirya chair is made of mesh, and the seat is made of padded leather. The seat measures 19.9 inches by 19.7 inches. 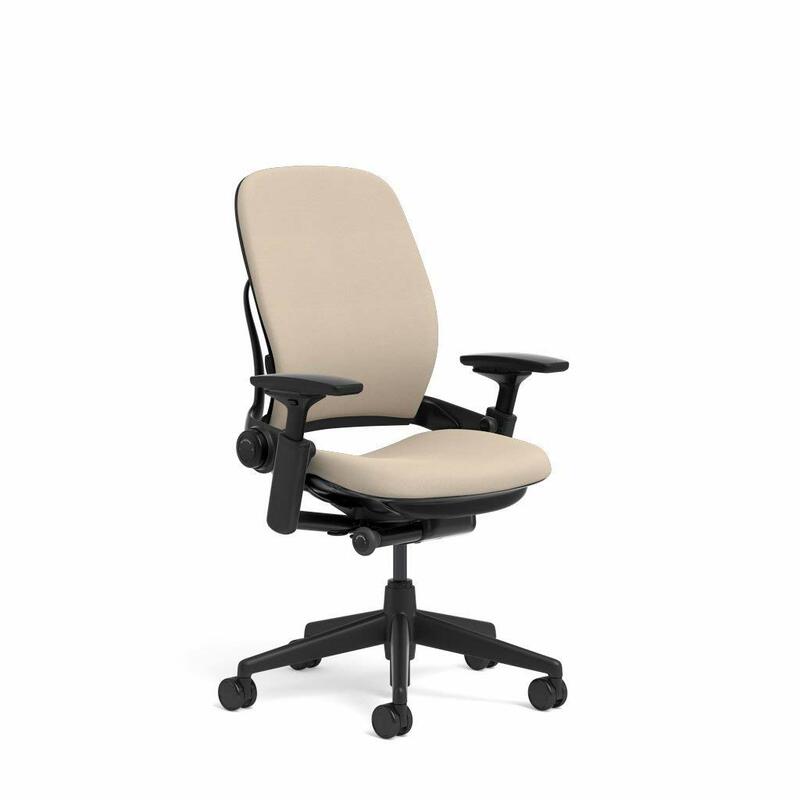 The mesh on the back of the chair provides ventilation to keep you cool even in the warmest office. The back of the chair is described as an S-shaped grace design. The back of this chair seems to be taller than the other options thus far. It is 30.3 inches x 18.5 inches. The chair weighs 30.6 pounds. It measures 33.1 x 25.8 x 10.1 inches. There is not a weight limit listed for this product. The Kadirya chair is extremely adjustable. Do you want to be able to tilt? You can move your chair from a 90-degree angle to a 100-degree angle. Do you not want to be able to tilt? Adjust the tension of the nob, and that feature disappears. The chair also swivels 360 degrees and is on a five-star base with castor wheels. The height of the chair can be adjusted with a pneumatic lever. The lowest setting is 17.7 inches, and the highest is 21.7 inches. If you tend to be on the shorter side, you might want to make a note of this. The lowest setting on the Kadirya chair is taller than other chairs listed. The arms on the Kadirya chair can be adjusted up and down 4 inches. It doesn’t look as if the arms can be removed or rotated out of the way. It is unclear how the arm adjustment is made on the chair. The chair only comes in one color, black. Customers can purchase this chair assembled or unassembled. This chair is a little more expensive than the other chairs listed so far, and the assembly is about the same amount as for the other products. For this product, the assembly price is about half the price of the chair itself. Most would find assembling this product is an easy task so keep that in mind before spending the money on assembly. Even though this product is pricier than the previous three chairs discussed, it offers a lot of benefits. It is extremely adjustable. It offers a mesh back and leather base. The mesh back is undoubtedly a benefit for those who get hot easily while working. The drawback of this product could be the price, although it still seems very reasonable for a product that receives so much use. It looks as the chair is divided into three different support systems. The mesh headrest provides support, but it doesn’t look like it gives much cushion, on the top of the head. The support of the upper back seems to wrap around the shoulders. Again, this is made of a mesh material to offer breathability. The lower back cushion looks as if it is made of leather and provides lumbar support. The lumbar cushion is adjustable and seems to be the first of the chairs reviewed that has this feature. The Coavas Chair is described as an executive chair. The measurement of the seat does not seem available. The measurement of the backrest does not seem available either. This is perhaps because the backrest looks as if it could be measured as three separate pieces. The chair weighs 30.9 pounds. This is a particularly light-weight chair. It measures 25.2 x 25.2 x 51.6 inches. There does not seem to be a weight limit for the chair listed anywhere in the product’s description. Like the others, the Coavas chair offers a free range of motion. Those sitting in the chair can rock and recline easily. This product has a tilt lock for those who want to lean back, but don’t want the ability to rock while sitting in the chair. I’m not sure who would desire this. The chair also swivels 360 degrees. The chair sits on a five-star base with caster wheels. Adjust the height of the seat with ease. The seat can be adjusted four inches either way. The height of the arms can be adjusted as well. Although, the arms are not padded with cushions. It does not look as if you can purchase this product already assembled. Although, it can be constructed easily at home. There are several benefits of this product over the previous products discussed. First, having adjustable lumbar support would be beneficial for those who suffer from lower back pain. A mesh backing could also be a desired benefit of this product. The product’s design is very contemporary looking. Those who are concerned about comfort and design might find this chair interesting. Every chair listed has its critics. The Coavas is not an exception. Some say this product does not withstand continued use. Others find it a quality product. If you require your chair come preassembled, you may not want to purchase this product. You also may be turned off by the contemporary look of this piece of furniture. Do you like to lean back? Waaay back? Consider the Vanbow office chair. 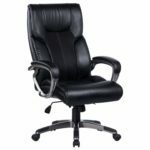 While some of the best high back office chairs in this list look like they provide little softness. Although, the manufacturers of this chair seemed to focus on the depth of the cushions. This traditional-looking chair has a plush memory foam seat cushion. The back is made of breathable mesh and PU leather. This allows for easy cleanup for spills. The Vanbow Chair is described as an executive or computer chair. The seat measures 20.5 inches by 20.1 inches. The depth of the seat is 4.7 inches. This seems thicker than the other seats mentioned thus far. Besides being made of high-density foam, the seat of the chair also has a built-in innerspring. The measurement of the backrest seems to be 29.1 inches. This is not as tall as some of the other options. Even though the product is described as being made with mesh, it does not have air holes for air to flow through. It looks more like a traditional leather-backed chair. The product’s fabric could be better described as breathable. This chair seems a little heavier than the other ones so far. It weighs 43 pounds. It measures 25.8 x 30.3 x 44.1-47.8 inches. The manufacture-suggested weight limit is 250 pounds. Like the others, the Vanbow chair offers a free range of motion. Those sitting in the chair can rock and recline easily. It is not clear if this product has a tilt lock on it or not, but it does provide a tilt tension option, which increases or decreases the ease of leaning back in the chair. The range of tilting is from 90 degrees to 110 degrees. The chair also swivels 360 degrees. The chair sits on a five-star base with caster wheels. Adjust the height of the seat with ease with the pneumatic lever. The seat can be adjusted almost four inches either way. The height of the arms cannot be adjusted. The arms are padded with cushions. The Vanbow chair comes in black only. It does not look as if you can purchase this product already assembled. It can be assembled quickly. There are several benefits of this product over the previous products discussed. First, this seat looks as if it provides more cushion than the competitor’s products. The seat not only has a thick cushion, but it also has a spring built into it. This chair also seems to tilt back farther than the competition. It is very traditional looking. While some look at the range of motion as a plus, others might find it difficult to work with such a tilt. Even though the chair is not marketed as a gaming chair, perhaps that would be the better fit for this product. 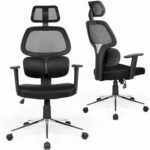 Furmax has another entry on the list of best high back office chairs. This time, the Furmax chair is much more traditional looking. The last Furmax product was marketed as a gaming chair. 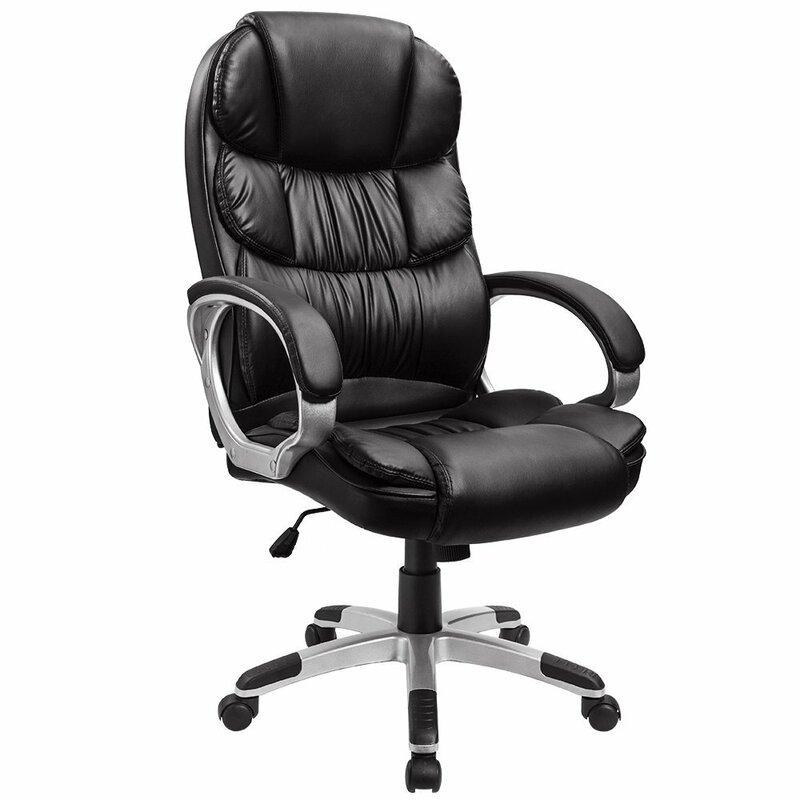 This chair is described as an executive or computer chair. This chair is upholstered in bonded leather. Bonded leather, also called reconstituted leather or blended leather includes real leather (sort of). The leather is shredded and mixed with polyurethane and attached to a material backer. While it has leather in the name of the material, that word needs to have a giant asterisk near it. It can not be considered a leather chair. 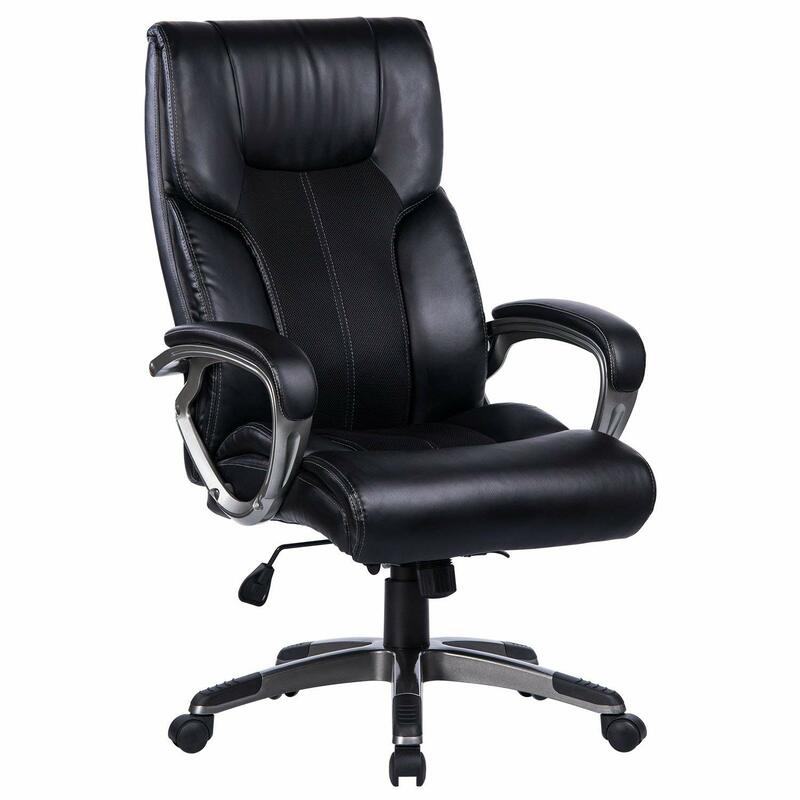 The Furmax Executive Chair has a seat measuring 20.9 inches by 20.1 inches. The measurement of the backrest seems to be 29.9 x 27.9 inches. The back cushion is made of bonded leather as well. The chair’s weight does not seem listed on the website. It measures 29.5 x 23 x 12.6 inches. The manufacture-suggested weight limit was 300 pounds. This is the largest recommended weight for any of the chairs thus far. This Furmax chair offers a free range of motion. Those sitting in the chair can rock and recline easily. The tension can be adjusted that controls the ease of using the reclining feature. The chair can recline up to 20 degrees safely. It also swivels 360 degrees. The chair sits on a five-star base with caster wheels. Furmax promises that the caster wheels will not scuff the floor. Adjust the height of the seat with ease with the pneumatic lever. The seat can be adjusted almost 3.2 inches. This particular Furmax chair comes in black and dark brown. The price is the same regardless of color. You can purchase an assembled version of the Furmax chair. Although, keep in mind that the assembly cost is almost exactly the same as the cost of the chair itself. 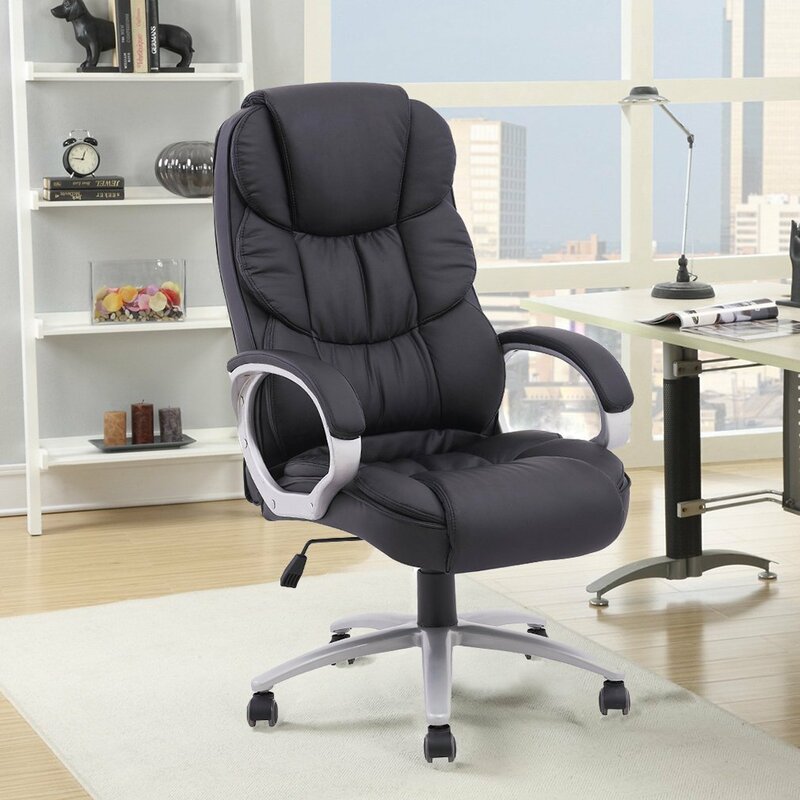 One benefit of the Furmax executive chair is that it is upholstered with a higher quality material. Some may regard the bonded leather as softer than the PU Leather product. 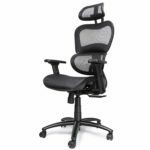 The Furmax chair also tilts back farther than some of the other best high back office chair options we have discussed. This chair also has a separate piece that provides lumbar support. It also has a more traditional look than some of the chairs discussed in this piece. This may or may not be a benefit, depending on the style you are going for in your office. This product is relatively new to Amazon. We will have to see if this product holds up over time and use. Since the product is so inexpensive and is made from a higher-quality covering, it may be worth the gamble to try it out on your own. 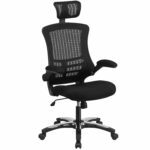 Who knew there were so many companies making great high back office chairs? Komene’s Mesh Office Chair is another sample of a mesh office chair that has an ergonomic design. The Komene chair is very similar in style to the fifth chair reviewed, the one manufactured by Coavas. Both chairs look much less traditional. It seems as if the focus is on support rather than cushion and style. If you have back or leg issues, you are probably less concerned with how the chair looks and instead more concerned with how it makes you feel. This high back office chair is marketed as a conference or executive chair. The product description says that this chair offers more neck support than other models. It also prevents cervical spondylosis, which starts from stiffness in the neck and shoulder areas. Also, this chair allows the user to recline up to 135 degrees. This is considerably more than the other chairs and enables the user to stretch out his or her back periodically. The other bodily benefit of this chair is that it puts less pressure on the hips and buttocks. The product description says that the soft material the chair is made of helps relieve that pressure. 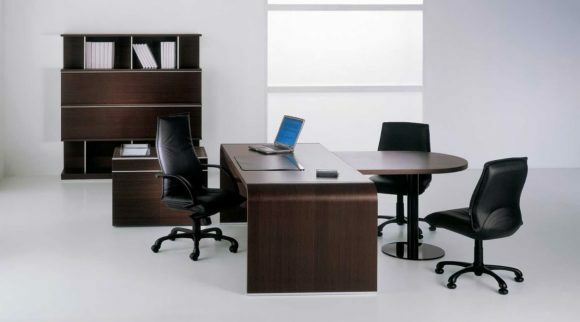 The Komene Executive Chair’s seat measures 17. 3 inches from the front to the back. It is not clear how wide the seat is. This seems to be one of the only chairs where the seat is made up of mesh. The other mesh chairs described have a solid seat, and the back is usually made of mesh. The manufacturers of the Komene chair say the mesh adds to the comfort of the user. The measurement of the back of the chair does not seem available either. The backrest is made up of three different sections. The headrest, the shoulder support, and the lumbar support are all adjustable. The back of the chair is also made of mesh. At 47.5 pounds, this is the heaviest chair listed so far. It measures 29.4 x 26.1 x 13.2 inches. Even though the chair is heavy, there is a weight limit of 275 pounds for users. This is not the highest weight limit discussed thus far. The Komene chair allows the user to sit up at 90 degrees or recline at 135 degrees. The recline function can be locked in place at any angle in between. This feature would be perfect for someone who needs 30 winks in the early afternoon before finishing his or her day. The larger headrest would also support the neck and head during this time of rest as well. Like all the other products so far, the tension of the tilt can be adjusted too. This chair also swivels 360 degrees. This chair sits on a five-star base with caster wheels. The wheels are non-slip. Adjust the height of the seat with ease with the pneumatic lever. The seat can be adjusted almost 3.8 inches. Unlike most of the products reviewed, this chair allows you to move the arms to the right, left, forward, and backward. You can also adjust the height of the armrests. It looks as if the armrest offers a slight amount of padding. This is a benefit as it allows for larger body types to fit between the arms of the chair with ease. The Komene chair comes in black. You can purchase the chair assembled. The cost appears to be the same for assembly regardless of the cost of the chair. There are many benefits of this chair. As mentioned, this would be the perfect chair to nap in should you feel the need for refreshment during work. The netted material also allows for air flow all over the surface of the body. The most significant benefit of this particular model is the flexibility of the armrests. No other chairs listed can move the arms in so many different directions. It is unclear whether or not the arms can be removed entirely or not though. One of the negative attributes of this chair is the price. The chair is pricier than the other options, but if you have back or neck issues, or if you require a mesh seat, you may not be bothered by spending the extra money. 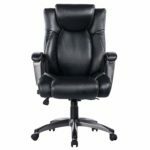 Another option for those of you who enjoy the look of a traditional executive chair is this high back office chair by Vanbow. Like the other Venbow product, this chair looks well padded and comfortable. It features a double padded headrest and seat. Like the other Venbow product, the seat also has a built-in spring system that makes the user feel as if he or she is sitting on a sofa. This Venbow chair is also upholstered with bonded leather and mesh, but again, don’t be confused by the description. The chair looks like a traditional leather office chair. The mesh covering does not allow for much air flow while you are sitting in it. Maybe a better description for this type of material would be that it is breathable. The Venbow Executive Chair has a seat measuring 20.1 inches by 20.5 inches. The seat cushion is 4.7 inches thick. This is the same thickness as the other Venbow product. The measurement of the backrest seems to be 29.1 x 20.1 inches. The back cushion is made of bonded leather as well. Again, the backrest also features a headrest made with a double cushion. The chair weighs 43 pounds. It measures 31 x 26.2 x 14.8 inches. The manufacture-suggested weight limit is 250 pounds. The base of the chair is 25.8 x 30.3 inches. This Venbow chair offers a free range of motion. You can recline with ease or add tension, so the reclining movement is more purposeful. The user can lock into whatever angle is desired. The chair can be reclined from between 90 and 110 degrees. This is less of a recline than some of the other products listed. Like all the other chairs listed, this chair also swivels 360 degrees. This chair also sits on a five-star base with caster wheels. Adjust the height of the seat with ease with the pneumatic lever. The seat can be adjusted almost 3.7 inches. The height of the arms cannot be adjusted. The arms are padded with cushions. The length of the arms is 15.7 inches. This particular Venbow chair comes in black. Purchasing this chair already assembled does not seem to be an option. It seems as if this Venbow chair has almost all the same features as the previous Venbow product described. The only difference that can be seen is the shape of the cushions. The back of this unit seems to have more of a curved cushion. The back cushions look thicker than the other Venbow product. The benefit of the Venbow products over the others is that they look like a more traditional executive chair. If you are more concerned about the ergonomics of a chair, this is probably not the one for you. It is not adjustable. The last best high back office chair we will be discussing is the most expensive offering so far. 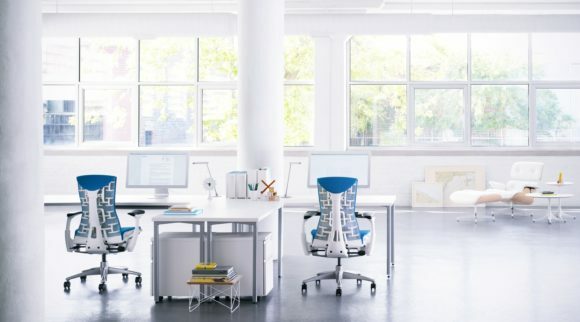 It is called the Steelcase Leap Task Chair. Since this chair is over ten times the amount of the least expensive chair listed in this article, one would hope that it has a lot of features that make the added expense worth it. The product information for this chair says its back and seat design can increase efficiency and productivity. Wow. Maybe I should purchase this chair. It would end up paying for itself in the long run. Or would it? The chair looks like a regular office chair. It does not have an unusually tall back. Nor does it have an abundance of cushion. It seems more like an executive assistant chair rather than the chair of a CEO. The chair boasts of having a Live Back Technology. It moves as your back moves, and supposedly mimics the movement of your spine. It is unable to be seen, but the product has slats built into the back and seat of the chair that allows breathability. The special padding used over the slats allows airflow. The type of padding is not listed. The only descriptive word used is “special.” I would hope this padding is extra special to be ten times more expensive than the other chairs. Perhaps it is stuffed with twenty-dollar bills (we can dream, right?). 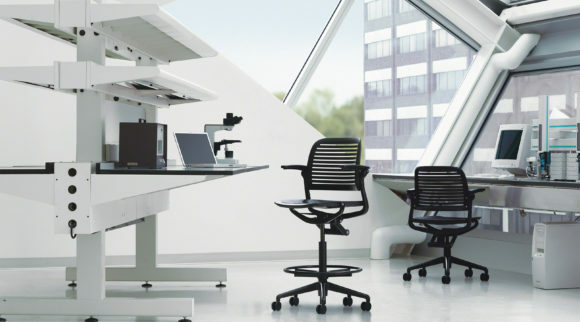 Unlike any other product listed, the Steelcase product allows you to adjust the depth of your seat. This accommodates different body shapes and sizes. The seat also has a flexible seat edge. When you recline or lean forward, the edge of the seat flexes to relieve pressure on the back of the legs. The measurements for the seats do not seem available. This is the only product discussed that has this feature. One would think this would be particularly important for people who are vertically challenged. The measurements of the backrest are not available either, but the product literature says the ergonomic design allows the back of the seat to literally change shape to offer support for your entire spine. There is a lower back firmness control that will enable you to adjust the appropriate amount of firmness around your body’s natural curve. The upper back control also allows the user to set the amount of “push back” that you desire as you recline. It is unclear is this setting is similar to the reclining tension feature offered in all of the other chairs listed. The chair weighs 66 pounds. This is the heaviest chair listed so far. It measures 24.8 x 27 x 43.5 inches. The manufacture-suggested weight limit is 300 pounds, which ties with the Furmax chair as the largest weight accommodated by an office chair. Oddly enough, it is not clear whether or not the Steelcase chair reclines and to what degree. The recline is described as “slightly different” than other chairs. It looks as if the body of the chair offers flexibility in the design that allows you to push against it to recline. Like all the other chairs listed, this chair also swivels 360 degrees. The chair sits on a five-star base with caster wheels. In addition, the user must assume that the height of the chair can be adjusted. There doesn’t seem anything in the listing that says if this is true or not, even though it would seem surprising if such an expensive product did not include this primary feature. It is not clear what the exact height of the chair is. One of the features described for this chair is the natural glide system. This system allows your seat to glide forward and your back to recline without leaving your vision and reach zone. This allows you to move your body while staying focused on your work. It is not clear how this system is different than any other system with caster wheels at the base. Perhaps the benefit is that instead of saying you are rolling from one place to another, instead you can say you are gliding from one place to another. The arms on this chair are extremely adjustable. They can be adjusted by height, depth, width, and they can also pivot. There does not seem to be any cushion on the arms of the chair. 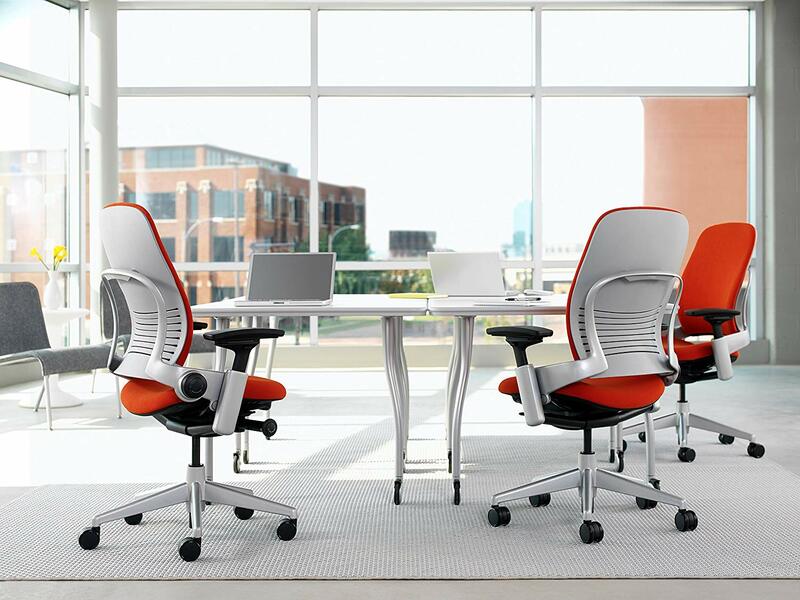 The Steelcase chair comes in a wide variety of colors. Colors available are black, burgundy, alpine, blue, cyan, gray, sable, camel, coconut, graphite, nickel, and navy. The price of the chair does not seem to be altered by the color you choose. It is not clear whether or not the material differs depending on the choice of color. Some of the offerings are described as “fabric” while others do not specify the upholstery type. One of the apparent benefits of this chair is the variety of colors it comes in for purchase. The other benefits of this chair could only be noticed upon sitting in it. Only then will you be able to determine if the slats provide airflow and whether or not the adjustment knobs for the upper and lower back will enable you to get the support and comfort you need while sitting. It would behoove you to read many reviews of the Steelcase chair before purchasing it. Since it is so much more expensive than the other chairs listed in this article, you probably need to thoroughly understand every aspect of this chair before you purchase it. One thing to note, upon assembly, the chair cannot be unassembled. This will make returning the chair to Amazon tricky. Which is the best office chair on the list? It depends. 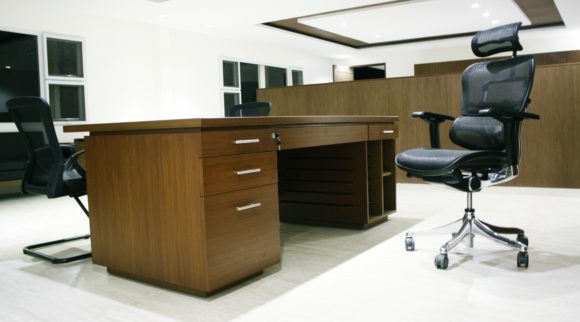 There are several factors to consider while picking out a brand new office chair. Do you have back issues? Problems with neck pain? Do your legs become numb easily? Are you able to stand and sit with ease or do you have mobility issues? 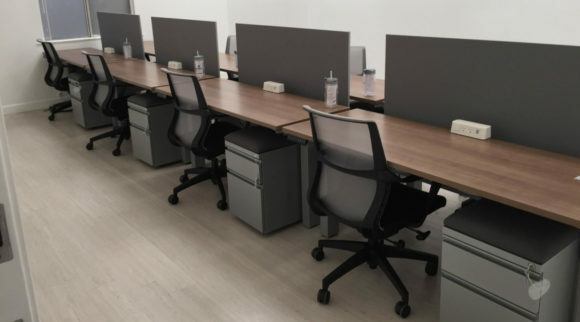 Although most of the best high back office chairs listed in this article boast an ergonomic design, some chairs seem to follow through with that promise more than others. 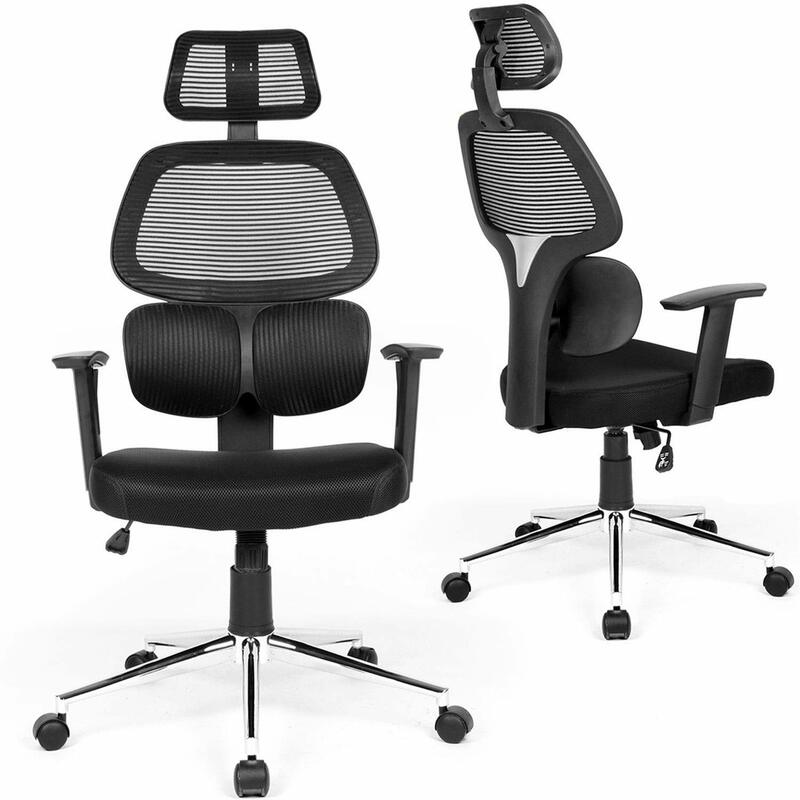 The Coavas and Komene chairs offer more head and neck support than the other models. They also provide specific lumbar support. The Steelcase chair may also contain appropriate lumbar support as well, but if it does, it seems to be well hidden within the chair’s design. Do you sit at a computer most of the day, or are you most of the time “in conference” with other executives? Do you make some other repetitive motion such as assembling parts or do fine detail work? You need to find a chair that enables you to do your specific job well. If you need to get close to your work, consider purchasing a chair that allows you to adjust or remove the arms. A chair’s arms can keep you from getting close to the item you are working on and may cause you to lean forward instead, putting unnecessary pressure on your back and neck. The Flash Furniture and Steelcase chairs allow you to pivot the arms out of the way completely. Other chairs such as the Komene, Coavas, and Kadirya also will enable you to adjust the chair’s arms. Those who spend the entire day typing may also have issues with the arms on a chair. If your body type is wider than most, pay attention to the width each chair offers between the arms. There is nothing more uncomfortable than having to squeeze your arms in a seat and spend the rest of the day doing a repetitive movement. Do you use your office chair to rest? Consider choosing a chair that allows you to recline farther back than other options. Some of these chairs also will enable you to lock the tilt in place so if your body relaxes during your resting time, you will not shoot forward off your chair. This would be a horrible way to wake up from a nap. Do you often sit with your legs up on your desk? The reclining option will be necessary for you as well if you have this habit. Are you hot-blooded? Do you work in an office without air conditioning? Are you uncomfortable and sleepy when you become hot? Do you sweat a lot? There are several options of mesh chairs available. Some seem to offer more air flow than other chairs. 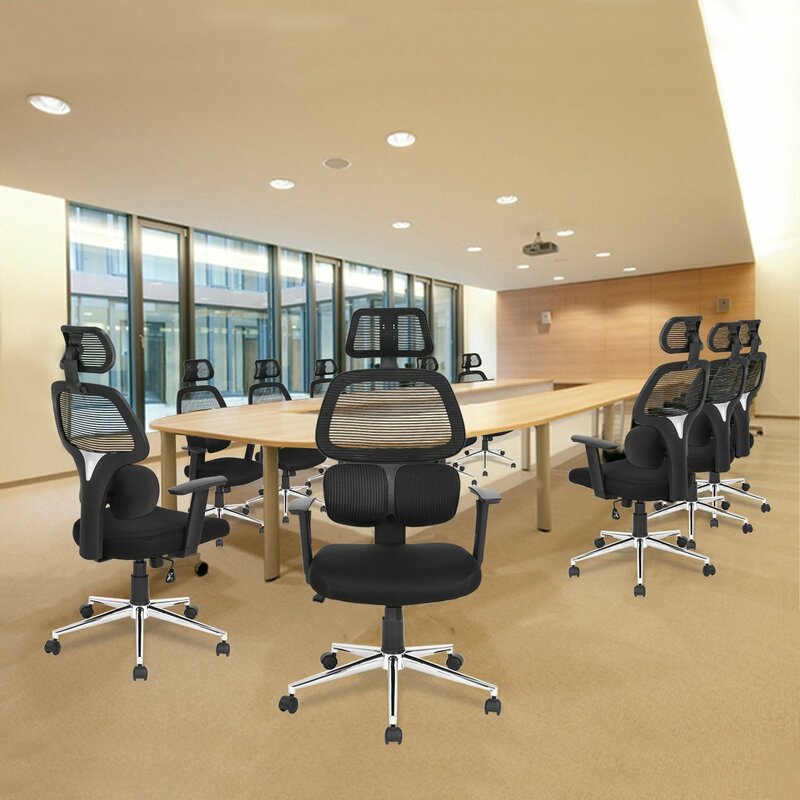 Avoid PU leather or bonded leather chairs if the heat is a problem for you at work. Let’s face it. For many, how a chair looks is terribly important. If you are an executive, you may want a chair that fits your image. 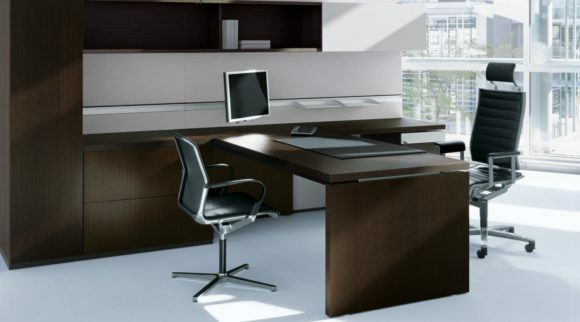 A padded leather chair may be what you are looking for when designing your office. For some, you may be looking for a chair that comes in a particular color to match the theme of your room or company. While all the chairs reviewed in this article comes with five caster wheels, it is unclear how well these wheels worked. 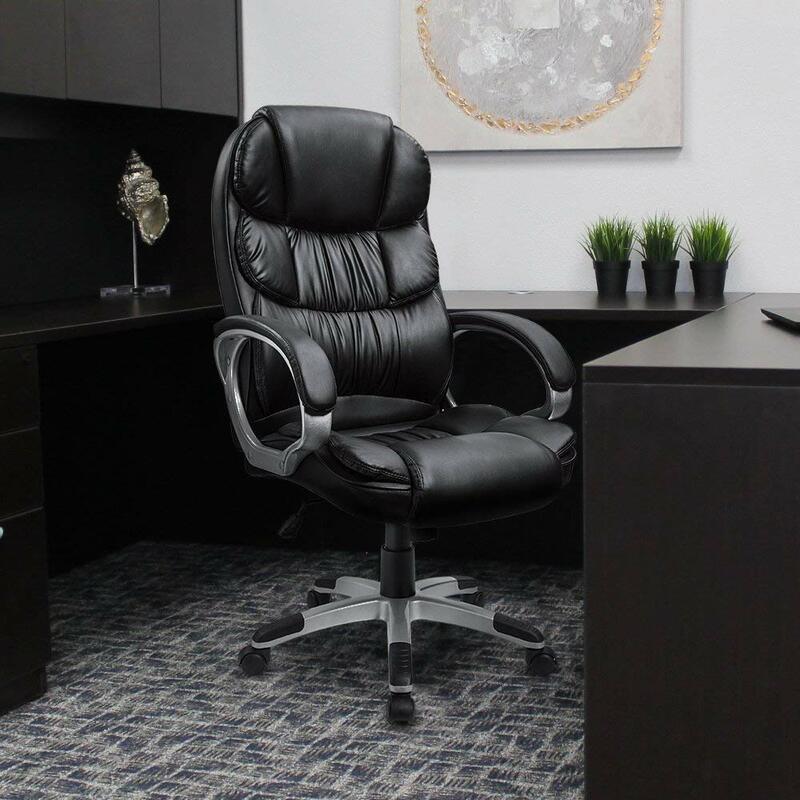 If your work chair sits on an uneven or rough surface, you may look closer into the product’s reviews to see if the chair you have in mind to purchase would meet your needs. This is also the case if your office chair needs to roll on carpet. Of course, if this is the case, consider purchasing a mat that fits under your desk to keep your chair moving smoothly from one task to another. Regardless of which chair you choose, make sure you are comfortable in it. You spend too many hours at work to sit in an uncomfortable chair. © 2019 Home Office HQ. All rights reserved.